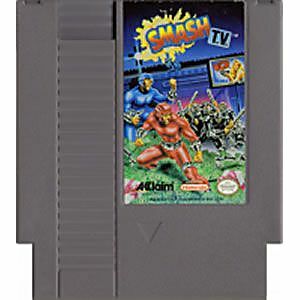 Smash TV original NES Nintendo Game cartridge only - Cleaned Tested and Guaranteed to Work! Smash T.V. on the NES has one blatant flaw : the controls, which will leave you questionning their technicality if you have ever played the SNES version. There are problems directing the shots in the right direction at first so you will have get acustomed to them before you can start enjoying it as much as its 16bit counterpart. You can hold still, shooting in one direction once you finally target the way you intended : Hold A + B and as long as you do, your running man will keep firing in this fixed direction, while you move across the screen. If the controls were anywhere near the SNES version, this game could get 5 stars, as it is one of the best Rogue-type games this side of Gauntlet But if you can: grab the SNES version instead for perfect controls and pure enjoyment. 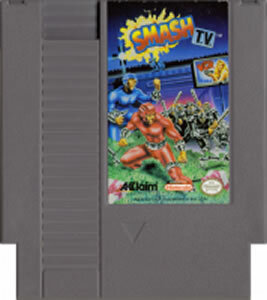 Still, Smash TV on the NES delivers in the fast-paced action department: you'll blast enemies to oblivion with the same variety of weapons and items as on the SNES, but those graphics are surely not as polished. The announcer will belch his fan favorite quotes like : "Big money, big prizes! I love it!" and "I'd buy that for a dollar!" But there is the second flaw: music will only play one loop before fading out until you complete the stage and move to the next wher ethe single loop song will once again run iots course once and leave you to finish the stage with what sounds incredibly akin to ATARI sound effects. If you like those though, Smash TV is also providing an uncanny retro feel to the experience. Took me a couple tries but go through the first stage, losing one room away from Mutoid man on my last try (700,000 points) after blasting through legions of enemies : don't know many other NES games that rivalize in this chapter. So all in all it's a great experience for what it is: and reaching the first boss can actually be a challenge even for veteran Super Smash TV players! Are you up for this retro challenge? 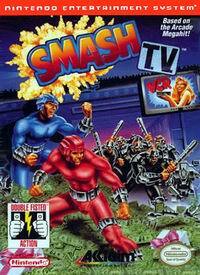 Grab Smash TV and see for yourself!